Surrounded by the steep Taurus and Amanus mountain ranges, the fertile alluvial plain of Cilicia Pedias in modern Turkey is a true treasury of important monuments from numerous ages. Hittite and Assyrian rock reliefs serve as representations of power at this connection between Anatolia and the Levant. Since it relies on Goggle Earth, the Virtual Cilicia Project is able to show you these monuments as well as the ruins of Bronze and Iron Age settlements like e.g. Karatepe with its world-famous carved orthostats in their natural environments. Follow the tracks of Alexander the Great, who made a sacrifice to Athena Magarsia at the northernmost point of Plain Cilicia, before he continued to the city of Mallos, which still has not been located despite numerous efforts. Be impressed by the well preserved ruins of the Hellenistic mountain fortress of Karasis, which is situated upon an inaccessible mountain summit and was only discovered as recently as 1994. Explore the hideouts of the dreaded pirates who terrorized the Mediterranean in the 1st century BC before being defeated by Pompeius Magnus, who forced many of them to settle in cities. Wander through Hierapolis, the residence of king Tarkondimotos, who had formerly been a pirate, but eventually was issued command of the region by Pompeius. Discover the foundations of one of the largest temples from the Roman Imperial Age and explore the extensive structures of Late Antique and Early Byzantine villages and settlements. Learn more about the Byzantine Period in Cilicia, the 5th/6th cent. AD existence of which is attested by the impressive remains of churches and fortifications at Anazarbos. Using the timeline integrated in Google Earth allows you to experience the historic development of settlement interactively and documents the gigantic castle building program, which surrounded the Taurus mountain ranges with massive fortifications during the time of the crusades (11th – 13th century AD). The Virtual Cilicia Project’s goal is to document the vast diversity of Cilicia’s history and to present this cultural heritage in the context of its ancient and modern landscape to the expert and the layman. We are continuously adding information on excavation sites and monuments as well as data concerning the landscape’s development, in order to make the understanding of this settlement chamber more accessible. Explore (Virtual) Cilicia – We are looking forward to your visit and your feedback! A researcher has identified the script used for annotations in the 1504 edition of Homer’s Odyssey held by University of Chicago Library. We will announce the results in a few days. Calling all historians of cryptography and stenography, Sherlockians (see “The Dancing Men”), and other amateur detectives! The collection of Homer editions in the Special Collections Research Center – the Bibliotheca Homerica Langiana(BHL) – includes a copy of the rare 1504 edition of Homer’s Odyssey that contains, in Book 11 (narrating Odysseus’s journey into Hades) handwritten annotations in a strange and as-yet unidentified script. This marginalia appears only in the pages of Book 11 of the Odyssey; nowhere else in the volume. Although the donor of the BHL is suspicious that this odd script is a form of 19th-century shorthand (likely French), he acknowledges that this hypothesis remains unsupported by any evidence offered to date. The donor of the BHL is offering a prize of $1,000 to the first person who identifies the script, provides evidence to support the conclusion, and executes a translation of selected portions of the mysterious marginalia. In addition to the photographs in this post, the volume is available to consult in person in the Special Collections reading room. Please visit the Special Collections website for information about requesting items to get started. The contest is open to all, regardless of University of Chicago affiliation. Please direct submissions to the contest, or questions, to Alice Schreyer, Assistant University Librarian, Humanities and Social Sciences and Rare Books Curator, or Catherine Uecker, Rare Books Librarian. Download high resolution page images. ASDIWAL, revue genevoise d'anthropologie et d'histoire des religions est produite et gérée par l'association des étudiants en histoire des religions de l'Université de Genève. Eclectique et ouverte, notre revue donne la parole aussi bien à de jeunes chercheurs qu'à des spécialistes reconnus. Elle demeure sans limite quant aux domaines abordés, tout en plaidant résolument pour une approche historique et anthropologique, un «regard éloigné», ainsi qu'un esprit de liberté et d'humour. ASDIWAL, revue genevoise d'anthropologie et d'histoire des religions is published and managed by the students in history of religions of the University of Geneva. Eclectic and open-minded, it combines the works of young researchers with those of renowned scholars. Our journal has no limits as to its fields of study, though deliberately pleading for a historical and anthropological approach, an “outsider perspective”, as well as a spirit of humor and liberty. La rivista è giunta al volume n. 75 (2009) ed è disponibile presso la Biblioteca del Dipartimento. Edited by J.M. Reynolds and J.B. Ward-Perkins in collaboration with Salvatore Aurigemma, Renato Bartoccini, Giacomo Caputo, Richard Goodchild and Pietro Romanelli (1952). Enhanced electronic reissue (2009), prepared by Gabriel Bodard and Charlotte Roueché, with new translations by Joyce Reynolds, maps by Hafed Walda and full illustration from the Ward-Perkins photographic archive of the British School at Rome. The first publication of Inscriptions of Roman Tripolitania, which appeared in 1952, has long been out of print. Produced in post-war conditions, it only included illustrations of a few inscriptions, although very many of them had been photographed; and it only offered limited geographic information. The purposes of this enhanced reissue are, therefore, to make the original material available again, and to provide the full photographic record, together with geographical data linking the inscriptions to maps and gazetteers, and so to other resources. Electronic publication makes this possible, and also allows us to offer greater functionality, such as free text searches. We have included the material from the supplement which contained further texts, numbered in the same sequence (973-996): 'Inscriptions of Roman Tripolitania: a supplement', published in PBSR 23 (1955), 124-147, and we have incorporated corrections and emendations made in that article; but we have not attempted to alter or emend any item otherwise. The indices of this edition are generated from the texts themselves. This means that in some cases they will diverge from those in the original edition, usually being fuller: but the material in three texts not included in that edition (261, 262 and 855) and the Neo-Punic personal names do not appear in these indices. 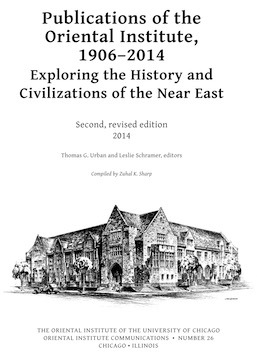 Published in honor of the celebration of the lifelong achievements of Dr. Matthew Stolper, head of the PFA Project, Monday, 28 April 2014, at the Oriental Institute. The smaller version (without couple of repeated sections on archives and administrative languages, about 11M) is posted here, and here. CDD S. The Demotic Dictionary of the Oriental Institute of the University of Chicago, Letter S. Words beginning with the letter S comprise the final letter of the CDD to be published. Kindly note that the final forms of the CDD letter files are being prepared for in print and online publication, along with supporting files (bibliography, text information, and number, month, and day words). The letter S occurs between the letters H and Sh (H with underline and Sh). I see that the letter S needs to be added under the Demotic characters for the letter S.
Publication of this volume commemorates the online distribution of all titles published by the Oriental Institute since its beginnings. All volumes are distributed online as Adobe Portable Document Format files (PDFs) and are available for complimentary download. Noet App: Includes up to 18 free books with download and registration. 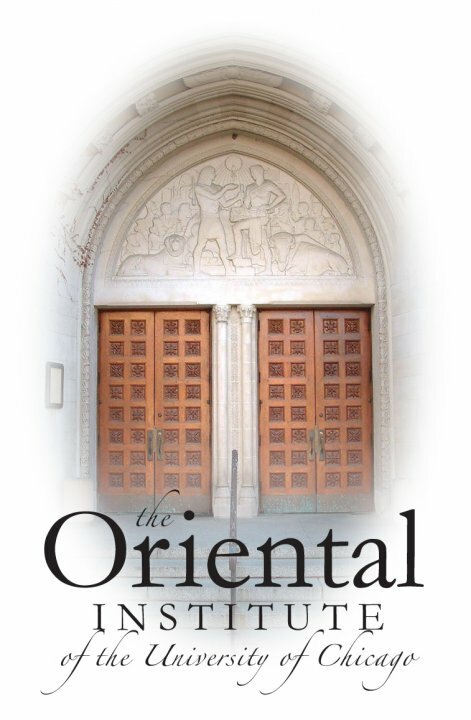 This is an on-going project that aims to provide public access to information about the diverse research and object-based collections managed and cared for by the Oriental Institute.